We’d love your help. 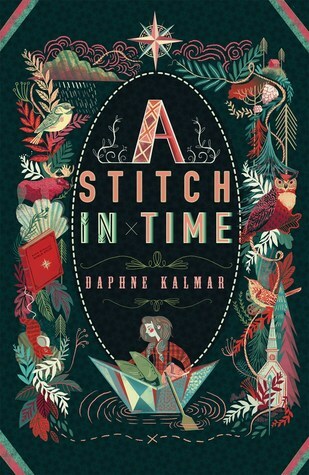 Let us know what’s wrong with this preview of A Stitch in Time by Daphne Kalmar. Donut is an eleven-year old geography buff who keeps her taxidermied mice hidden in her late mother’s hope chest. Her pops passed away, leaving her an orphan. Aunt Agnes has moved in, bringing along her lumpy oa An orphan grapples with her unpleasant aunt and the even more unpleasant idea of moving to Boston in this poignant middle-grade debut that handles loss and renewal. I am reluctant to read this one because of the taxidermied mice. Can anyone who has read this tell me what is going on there? I appreciate it! By all accounts, a rocky debut set in 1920's Vermont. A Stitch in Time intends to be the story of a girl grieving her father's death, but eleven-year-old Donut is more bratty and petulant than grief-stricken and tender. She's rude to her Aunt Agnes, who temporary leaves her job in the city to help her niece through this difficult time. And when she flees from Agnes, Donut revels in the idea that she could "light a pipe, drink a bottle of hooch, do any darn thing she pleased." When Donut's misgui By all accounts, a rocky debut set in 1920's Vermont. A Stitch in Time intends to be the story of a girl grieving her father's death, but eleven-year-old Donut is more bratty and petulant than grief-stricken and tender. She's rude to her Aunt Agnes, who temporary leaves her job in the city to help her niece through this difficult time. And when she flees from Agnes, Donut revels in the idea that she could "light a pipe, drink a bottle of hooch, do any darn thing she pleased." When Donut's misguided plans go awry, she sits "shivering and shaking and cussing." The only interesting quality Donut has to offer is her affinity for taxidermy. Her hobby is introduced early in the book but proves to have no real bearing on the narrative and no significant tie-in by its conclusion. With wooden characters, sluggish pacing, and an unlikable protagonist, A Stitch in Time is a hard no. Donut kicked at the soft soil at her feet. "We'd be sure to drug [Aunt Agnes] in the parlor so we wouldn't have far to heft her. And it wouldn't be stealing, just borrowing the truck. We'd ship her off to South America. Buenos Ares, maybe. With my poker winnings, I've probably got enough for the postage. We'd pack her up with jam jars filled with water, canned salmon, and crackers. And she'd need a pot to pee in. We'd throw in her knitting to pass the time. She could knit those old socks in the dark. Waking up in the crate would surely send her round the bend. She'd forget her name, join a convent." I adored this beautiful, timeless story about Donut and the challenge of having to leave home. Donut's connection to the only place she knows, her tiny town in Vermont, is palpable, which makes the forced wrenching of her from that place, after her father's accidental death, so painful. This slight historical novel holds equal appeal to adults and children, in my opinion. There's so much to savor in the language and setting. A gorgeous debut. Fantastic! Donut's whole village is so alive that that one feels like Donut’s traveling ultra-ego. Beautiful language and images give fullness to this novel loved by my grandkids. A great read aloud to boot. Remember being ten years old and wanting adults out of your business? In Stitch,set in 1927, orphan-girl Donut Sedgewick runs away and lives successfully in the woods (view spoiler)[at least for a while (hide spoiler)] in Walden-esque communion with nature. She's rebelling against the inevitability of being taken from her Vermont farm-village home after her father's death. First-time author Daphne Kalmar captures Donut's love of nature and her capability in it. Remember being ten years old and wanting adults out of your business? In Stitch,set in 1927, orphan-girl Donut Sedgewick runs away and lives successfully in the woods (view spoiler)[at least for a while (hide spoiler)] in Walden-esque communion with nature. She's rebelling against the inevitability of being taken from her Vermont farm-village home after her father's death. First-time author Daphne Kalmar captures Donut's love of nature and her capability in it. Kalmar also faithfully depicts grieving without either shortchanging the process or letting it overshadow the rest of the story. Engineering-brained readers (like me) will recognize and appreciate the craftspeople in the story. Donut's father was a tinkering inventor, and her favorite adult is an absent-minded taxidermist. Donut is a vivid character and I was enthralled with her adventures. The setting was terrific, too! Loved Donut—what a fun and bright child she is. Plus a little adventure, drama and a whole lot of love. Got a bit choked up at the end. Received at ALA Midwinter 2018. Eleven-year-old Dorothy “Donut” Sedgewick has recently lost her father. (Her mother died long before the start of the story) Now her Aunt Agnes has moved in to look after her, and has plans to move the two of them to Boston where Donut can attend the school Agnes and her sister, Jo, run. As if it wasn’t bad enough that Aunt Agnes serves lumpy oatmeal for breakfast and disapproves of Donut’s taxidermy hobby, now she wants to take Donut away from everything she’s ever known. And even Sam, the loca Eleven-year-old Dorothy “Donut” Sedgewick has recently lost her father. (Her mother died long before the start of the story) Now her Aunt Agnes has moved in to look after her, and has plans to move the two of them to Boston where Donut can attend the school Agnes and her sister, Jo, run. As if it wasn’t bad enough that Aunt Agnes serves lumpy oatmeal for breakfast and disapproves of Donut’s taxidermy hobby, now she wants to take Donut away from everything she’s ever known. And even Sam, the local taxidermist can’t convince Agnes to stay. So as a last resort, Donut takes her father’s folding boat and runs away to a cabin on the other side of the lake, hoping Aunt Agnes will give up and go back to Boston without her. There’s something very raw and real about the way Donut handles her grief over her father’s death. She won’t admit it to herself, but she desperately tries to hang onto her father’s memory: his shed full of inventions, his spot at the weekly poker game, his friend Sam the taxidermist… And even when Agnes tries to make a peace offering - the very Atlas Donut had been saving up for - Donut refuses to let this woman into her life. I was excited and surprised by the depth of this story and the creative way it was told by Daphne Kalmar. It deserves another star but I don't want to give the author the feeling that she is amazing and has achieved the best and can now relax. She needs to carry on with the craft that she seems to really understand....writing for the young and young at heart. In Kalman's debut novel, A Stitch in Time, (not a wrinkle), Dorthy, aka Donut is an eleven year old you will want to follow. Or maybe a to I was excited and surprised by the depth of this story and the creative way it was told by Daphne Kalmar. It deserves another star but I don't want to give the author the feeling that she is amazing and has achieved the best and can now relax. She needs to carry on with the craft that she seems to really understand....writing for the young and young at heart. In Kalman's debut novel, A Stitch in Time, (not a wrinkle), Dorthy, aka Donut is an eleven year old you will want to follow. Or maybe a totally different person with the same feisty, strong, loving nature that made Donut a very believable Tween. The secondary characters were well developed too. The adults acted like adults and the children were children. I'm intrigued with this "new to me" line of books Macmillan Publishing called Feiwel and Friends Books., "a publisher of innovative children’s fiction and nonfiction literature, including hardcover, paperback series, and individual titles. The list is eclectic and combines quality and commercial appeal for readers ages 0-16. The imprint is dedicated to “book by book” publishing, bringing the work of distinctive and outstanding authors, illustrators, and ideas to the marketplace. Feiwel and Friends is defined and guided by our principle: Our books are friends for life." Unfortunately, the illustrator of the book's cover was not easy to identify and credit. Yet it is because of the very attractive cover that I plucked it off the display case in the children's space at my local library. The author gratefully thanks Karl James Mountford for the gorgeous cover in her acknowledgments as well as the Feiwel team. I should thank my librians for introducing me to new author that I will want to follow. This book will definitely be a friend for life. A great short read which deals with some tough emotional issues, I'd recommend this book to the middle school crowd looking for adventures, or for realistic fiction. Because the story is set in the 1920s in rural Vermont it could also appeal to historical fiction fans! I liked how the story portrayed Donut's difficulties in coming to terms with her father's death, along with her dislike of her aunt's arrival and insistence on her moving to Boston. Emotionally weighty stuff, but worth a read! Evocative and poignant! Set in 1920's Vermont, Donut is dealing with the loss of her father, the intrusion into her life by her strict Auntie and an impending move to Boston, away from her beloved village, friend and memories of her father. Impetuous and head-strong, Donut first tries several schemes before finally running away - but not too far. Beautifully written, both the setting and the characters truly shine in this charming short book. Donut's growth is crafted wonderfully here as are her Evocative and poignant! Set in 1920's Vermont, Donut is dealing with the loss of her father, the intrusion into her life by her strict Auntie and an impending move to Boston, away from her beloved village, friend and memories of her father. Impetuous and head-strong, Donut first tries several schemes before finally running away - but not too far. Beautifully written, both the setting and the characters truly shine in this charming short book. Donut's growth is crafted wonderfully here as are her understated but deep relationships with so many people in the area who are all looking out for her in one way or another. Ultimately hopeful and very moving. I loved it! Donut’s pops has passed away in an automobile accident and now her Aunt Agnes has come to stay in their small house in rural Vermont. Donut has grown up there, surrounded by the woods and all of the people she considers friends. There is Tiny, a huge boy with a big heart, who is her best friend. There is Sam, the man who taught her to do taxidermy and who creates displays for museums. It’s the place that Donut belongs, one where she can see her father in every part of their home and also her mot Donut’s pops has passed away in an automobile accident and now her Aunt Agnes has come to stay in their small house in rural Vermont. Donut has grown up there, surrounded by the woods and all of the people she considers friends. There is Tiny, a huge boy with a big heart, who is her best friend. There is Sam, the man who taught her to do taxidermy and who creates displays for museums. It’s the place that Donut belongs, one where she can see her father in every part of their home and also her mother, whom she never knew. So when Aunt Agnes decides to take Donut back to Boston with her, Donut knows she must do everything she can to stay, even running away. Charming characters, a beautiful cover, and a gentle story of loss in 1920’s Vermont. Kalmar’s writing is smart and advanced in style without being advanced in content. Would be a great book choice for a younger advanced reader. Donut is still struggling with the grief of losing her father when her Aunt Agnes decides it's time to uproot her and bring her to Boston. Strongwilled and tied to her community, Donut decides she just isn't going, so she attempts to convince Aunt Agnes to stay. When it doesn't work, she decides to run away, holing up in a nearby cabin called Chanticleer. The hideout works for a while, but soon most of her friends know where she is and one night everything goes wrong, sending her back out of the Donut is still struggling with the grief of losing her father when her Aunt Agnes decides it's time to uproot her and bring her to Boston. Strongwilled and tied to her community, Donut decides she just isn't going, so she attempts to convince Aunt Agnes to stay. When it doesn't work, she decides to run away, holing up in a nearby cabin called Chanticleer. The hideout works for a while, but soon most of her friends know where she is and one night everything goes wrong, sending her back out of the woods and into Aunt Agnes' arms. Eleven year old Donut has had more than her share of loss and bad luck. She's got good friends, though, and a very firm resolve. When it looks like Donut stands to lose it all, she heads for the woods - literally! The whole town is rooting for her, and you will, too. "A Stitch in Time" is beautifully written. It's the perfect summer time read for your favorite young reader. I loved this book! Wonderful writing. Vivid setting. And Donut is such a passionate, often prickly, and yes, also tenderhearted character. A story with a classic feel. Loved the main character and her name. Opening really pulled me in - I wanted to hear more about Donut and her taxidermy skills. Had a nice cry at one point. Not a fan of the title of the book. Gorgeous book cover. 11 year old orphan in Vermont in 1927. Dorothy, known as Donut, has just lost her pops. She's fond of taxidermy and poker, nehi and geography. Loves her best friend Tiny (who is very large, of course) and her godfather and taxidermy instructor Sam. Always up for a paddle in the folding boat her father left behind, and absolutely opposed to leaving her idyllic village life for school in Boston with her educated aunts. It's a charming read, although the combination of quirky tr Gorgeous book cover. 11 year old orphan in Vermont in 1927. Dorothy, known as Donut, has just lost her pops. She's fond of taxidermy and poker, nehi and geography. Loves her best friend Tiny (who is very large, of course) and her godfather and taxidermy instructor Sam. Always up for a paddle in the folding boat her father left behind, and absolutely opposed to leaving her idyllic village life for school in Boston with her educated aunts. Gorgeous language!! I love the descriptions of place and time. My problems are personally I found the idea of taxidermy by a young child kind of creepy. I am sure it happens, but as a city girl, it just seemed strange. This little book was almost like a poem, inside Donut’s head a lot. The review inside the front cover is accurate: heartbreaking and heartwarming at the same time. Loved reading this book about loss, change, and history. Donut (what a wonderful name) is being forced to move to Boston with her aunt after her father dies. Donut plans all sorts of things to avoid having to move, but her ultimate attempt is nearly her undoing. I loved the setting of the little town, the impact of nature and being outside, the history of relationships and place. Nice book! What a perfectly set slim book about Donut, an 11 year old who has never had a mother and whose father died four days ago. She's lived a life of freedom with her father, learning to taxidermy from her godfather, playing poker with her dad on Friday nights and getting nice and muddy. What will she do now that Aunt Agnes wants to take her to Boston and make her go to a fancy school? Well, run away, of course. This is a beautiful slice of time in a young girl's life a long time ago in a place in Ve What a perfectly set slim book about Donut, an 11 year old who has never had a mother and whose father died four days ago. She's lived a life of freedom with her father, learning to taxidermy from her godfather, playing poker with her dad on Friday nights and getting nice and muddy. What will she do now that Aunt Agnes wants to take her to Boston and make her go to a fancy school? Well, run away, of course. This is a beautiful slice of time in a young girl's life a long time ago in a place in Vermont. The small town is illustrated beautifully, Donut's feelings are articulated well for a girl her age. This book really packs a full story in less than 150 pages. It's a perfect read alike for books like The Evolution of Calpurnia Tate and Moon Over Manifest. Donut is adjusting to the recent death of her father when her maternal aunt announces that she is taking Donut home with her to Boston. Donut (a.k.a. Dorothy and now an orphan) will have none of it. When her more conventional methods fail to persuade Aunt Agnes that Donut belongs in the only home that she has ever known, Donut determines to run away. A friendly neighbor has a somewhat abandoned cabin at the other end of a nearby pond and Donut sets up house keeping with the mice and a midnight b Donut is adjusting to the recent death of her father when her maternal aunt announces that she is taking Donut home with her to Boston. Donut (a.k.a. Dorothy and now an orphan) will have none of it. When her more conventional methods fail to persuade Aunt Agnes that Donut belongs in the only home that she has ever known, Donut determines to run away. A friendly neighbor has a somewhat abandoned cabin at the other end of a nearby pond and Donut sets up house keeping with the mice and a midnight bear for company. Her time in the cabin teaches her many things, perhaps most importantly that family belongs with family. In this sparkling, middle-grade debut, Kalmar gives the reader Dorothy “Donut” Sedgewick, a feisty 11-year-old Vermonter who this reader rooted for from page one. In the wake of her father’s tragic death, freshly orphaned and grieving Donut’s life tumbles even more upside-down with the arrival of her proper Aunt Agnes from Boston. Matters go quickly from bad to worse when Aunt Agnes informs Donut that in two weeks’ time she will be taking Donut back with her to Boston to live. Facing the loss of In this sparkling, middle-grade debut, Kalmar gives the reader Dorothy “Donut” Sedgewick, a feisty 11-year-old Vermonter who this reader rooted for from page one. In the wake of her father’s tragic death, freshly orphaned and grieving Donut’s life tumbles even more upside-down with the arrival of her proper Aunt Agnes from Boston. Matters go quickly from bad to worse when Aunt Agnes informs Donut that in two weeks’ time she will be taking Donut back with her to Boston to live. Facing the loss of all held dear: her friends, her home and her beloved Vermont woods, Donut marshals all her resources to block the move. The resulting tale is a gorgeously and humorously written, fast-paced romp where Donut, a cast of well-developed characters, and a lovingly depicted 1927 rural Vermont shine. This is a must-read folks: highly, highly recommend to all! Interesting children's historical fiction with a strong female character who is obsessed with geography and knows how to do taxidermy. In 1927 rural Vermont, 11-year-old Donut, recently orphaned after the death of her beloved father, stands to lose everything when she learns her Aunt Agnes plans to move her to Boston, but little does her aunt know that Donut has no intentions of leaving her friends or her home. She runs away from home. Captures the post WW1 New England vibe quite well... and Auntie isn't really grumpy/bad/mean, just a product of a different environment. Coming of age, dealing with loss, knowing oneself.